When the days are warmer and the nights longer, who the hell wants to be stuck in front of a hot oven? Especially when raw foods are super delicious – and of course, require zero cooking. 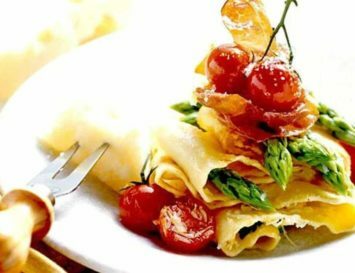 If the thought of summer fills your mind with images of BBQs and grilled foods, you may be struggling to come up with new and inventive recipes that you can enjoy this season. But I’m here to help inspire you! Luckily for us, there are a lot of great, fresh foods available over the summer that make raw dishes super tasty. 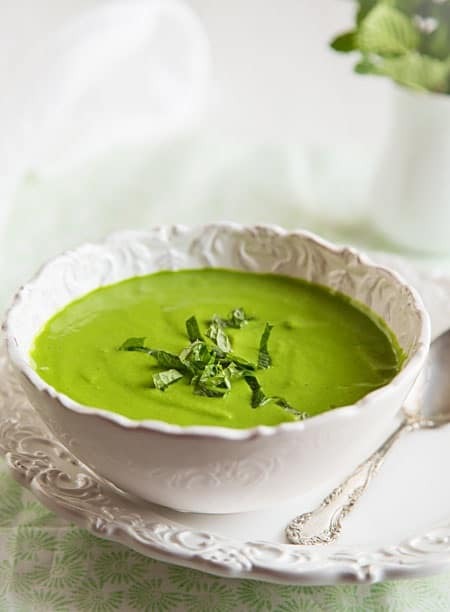 For example, avocado is a great base for salad dressings and soups, thanks to its creaminess, whilst fruits like juicy watermelon and berries make a quick and easy frozen fix – and let’s not forget seasoning with herbs like fragrant mint, thyme and basil! Start the day with a smoothie! Of course they’re all raw, and they’re a wonderful to use up fruit that may ripen fast over the summer. Go on, flood your bod with all those beneficial vitamins and minerals – and this recipe is just bursting with superfood powders, so with every sip you’ll feel like some kind of superhero, trust me. Is it a dessert? Is it a breakfast? Hmmm…let’s call this a desserty breakfast, maybe? I mean, it’s got all the natural sweetness you’d expect in a pie, thanks to dates, cherries and apples, but all the crunch you’d expect from a cereal, thanks to the nuts and chia seeds. Maybe the best solution is to just eat this in the morning AND after dinner? Nothing is going to cool your hot bod down faster than this recipe! It has all the makings of perfection. Crepes are simply heavenly, and ice cream…for breakfast?! Yes, yes and a whole lot more yes. The only thing that would make this even more perfect would be some kind of raw berry compote drizzle over the top ….drool. Porridge is a really great breakfast because 1. It tastes great, 2. It’s super fuelling and 3. It’s pretty damn good for us. So when it’s hot outside, why not make a raw version? Soaking the oats makes them super soft and almost gooey and using cold nut milk straight from the fridge will make it really cooling. This is a little bit of a fancy recipe, but strawberries are delicious during the summer so why the hell not make the most of them with a posh little dish like this? 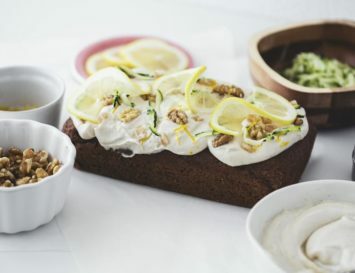 To make it 100% raw, you could simply top this on some raw sprouted bread chunks without toasting them – or there are some great cracker recipes further down, which would be wonderful with this. 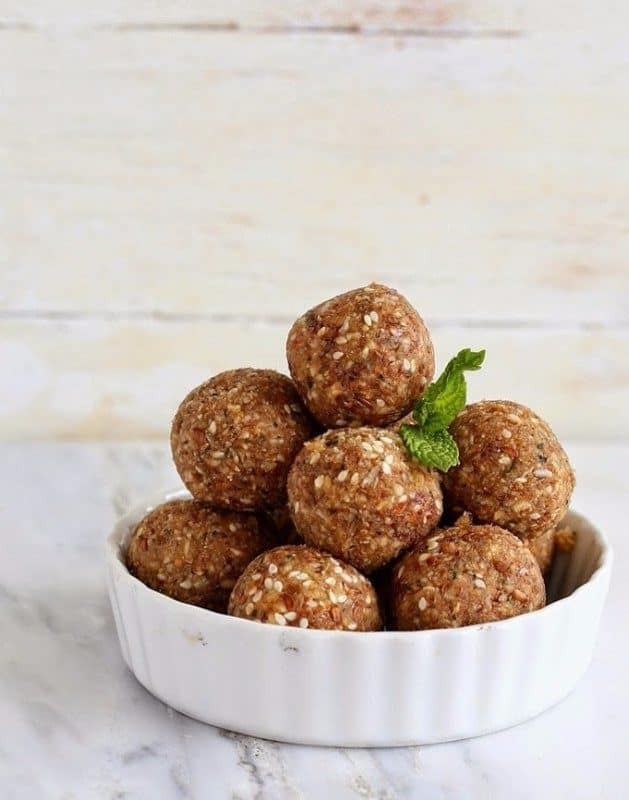 Energy balls are such a great treat, not only because they’re made from a range of goodness such as nuts and seeds that will give you the boost you need without a sugar overload, but they’re SO easy to make. You just blend stuff together, roll into balls and you’re good to go. These mojito inspired balls are sweet and sticky from the medjool dates, whilst having a lovely refreshing flavour from the lime zest and mint. The perfect raw summer snack! A raw cracker recipe with a raw spread to go on top of it – does life get better than that? The great thing about the raw olive spread is that you could also use it on some romaine lettuce or crudites for a quick and delicious snack. It’s super light, too, which is great for summer – who wants to be bogged down by heavy foods? If you’ve never tried onion bread before – you’re in for SUCH a treat. Once popped into the dehydrator (or low heat oven), it becomes super soft, so you can almost turn it into a wrap, and the onion is delicious. You can then use a spread on it, or pack it with houmous and lots of veggies. Salads are a great base for raw dishes, especially when recipes like this faux salmon pate can be paired with it. The contrast between the soft pate and crisp, crunchy veggies is delicious! And forget about calorific dressings; a simple splash of apple cider vinegar will give this a delicious tanginess and work well with the ‘mock’ fish. I love soup, but who wants to eat a hot bowl of soup when it’s summer? This creamy delight is as refreshing and healthy as it is gorgeous – just look at that colour! Dip in some onion bread (recipe above) and you’ve got a filling lunch. The dressing on this salad is SO sweet and creamy, all thanks to vegan mayo, maple syrup, apple cider vinegar, mustard and some spices. It has a real infusion of flavours that blend together to make one helluva bomb recipe. 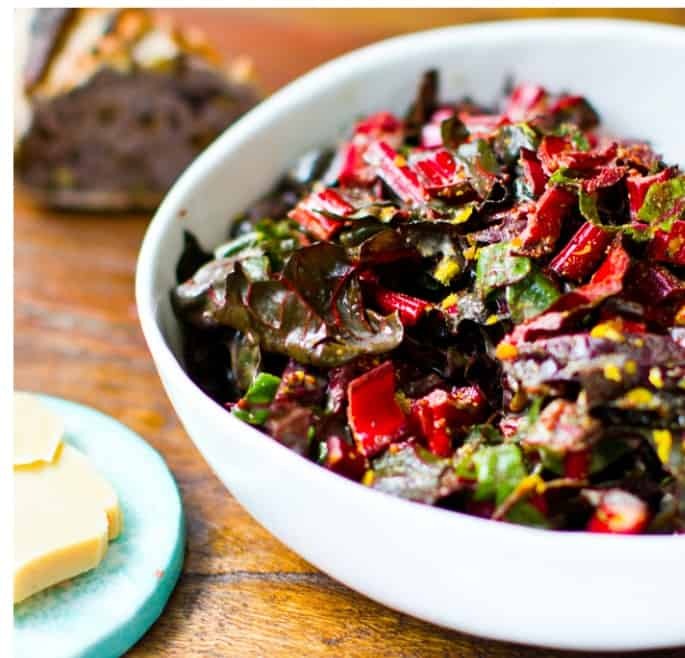 Simply mix it with a bunch of raw veggies and your salad goals are complete. When making a raw salad, cauliflower is such a great veggie to use because you can pop it into a food processor and pulse it down to rice-like grains without needing to add a cooked food such as rice or quinoa. The lemon, garlic and tahini based dressing really brings it together perfectly. 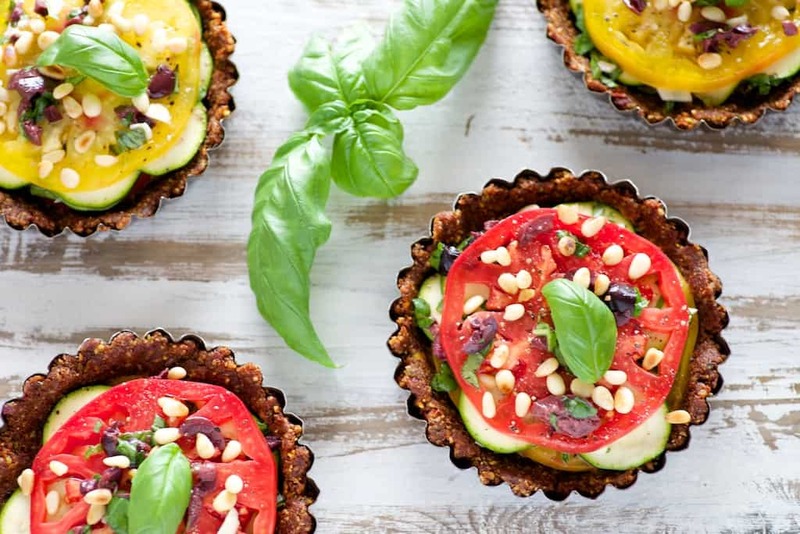 How yummy do these raw tarts look? The crust itself is made from flax seeds, pistachios and pumpkin seeds alongside sundried tomatoes, which add a really nice burst of flavour. You can then pretty much fill them with whatever ingredients you fancy, but I’d definitely recommend some raw cashew cheese. 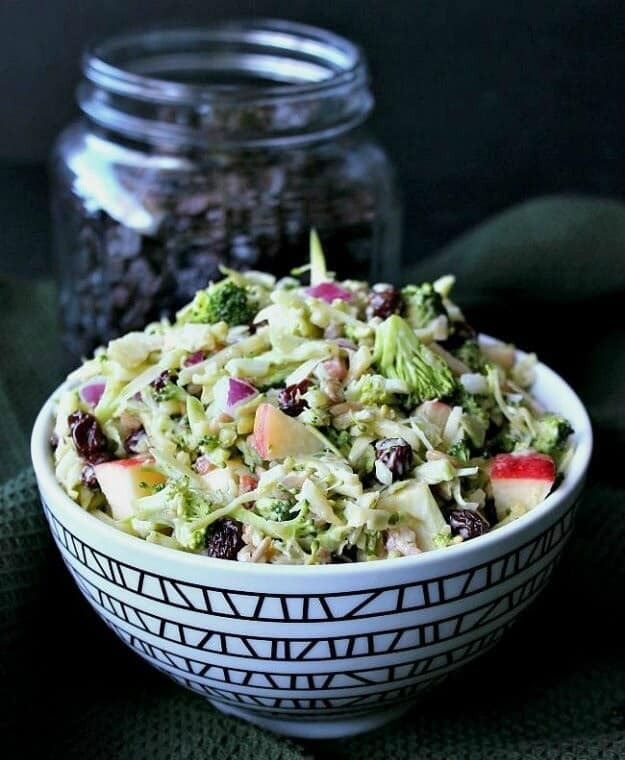 They may not seem like they go together, but you’d be surprised to learn that the tartness of apple mixed with the green flavour of broccoli actually get on quite well I’d definitely recommend a sweeter apple like a Gala or Pink Lady in this recipe, as the sweetness with complement the veggies and acidic dressing super well. 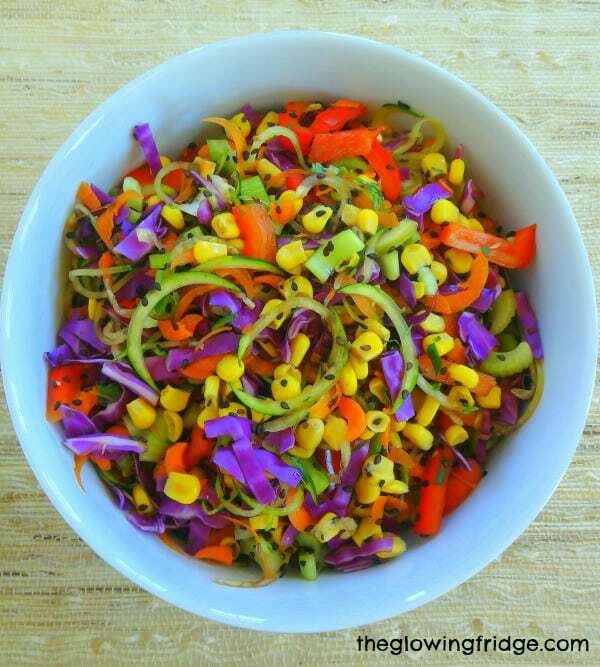 How could we not include the Queen of Raw foods in a recipe round up? I’m talking about Fully Raw Kristina herself. 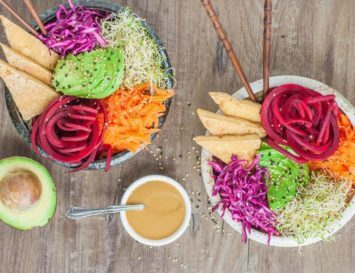 If you’re new to raw foods, then you need to go and check her out, as her recipes are downright revolutionary – you’ll be amazed and what you can do with raw ingredients! For example, this mango and avocado noodle salad – raw, creamy and delicious! Naturally, quinoa isn’t ‘raw’ so to speak, as it needs cooking, but this is a great raw recipe to make if you have leftover grains in the fridge that you don’t want to waste. Alternatively, you could make these using cauliflower rice if you want to make them 100% raw from scratch. Either way they’re tasty and you can add any veggies you fancy. I’d top these with some pickled red onion, but what can I say? I’m a daredevil. What would one of my food articles be without a taco recipe, huh? I’m all about that taco/Mexican food life, and any way I can enjoy my tacos, I am down for trying it – so I could hardly wait to try this deconstructed raw taco recipe! The taco ‘meat’ is made from a mix of nut and seed crumbles, and you’ll absolutely love it – believe me! Avocados are quite literally a godsend to this Earth! What a sad world it would be without their existence. However, STUFFED avocados are somehow even better. 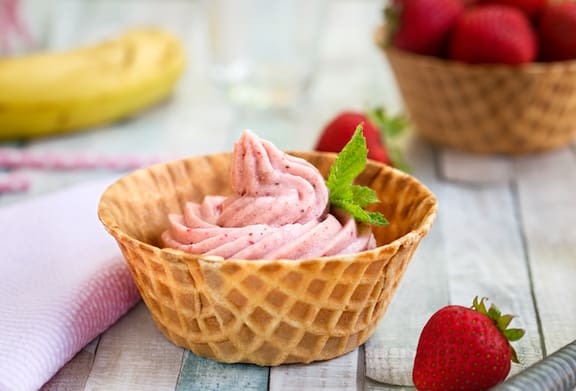 This creamy deliciousness is going to be an orgasmic treat for the taste buds this summer. The chipotle mayo itself is a raw recipe you can make from scratch and the delicate spiciness works splendidly with the creamy avo. Have all of the deliciousness of a cooked meal without having to turn the oven on to do so! 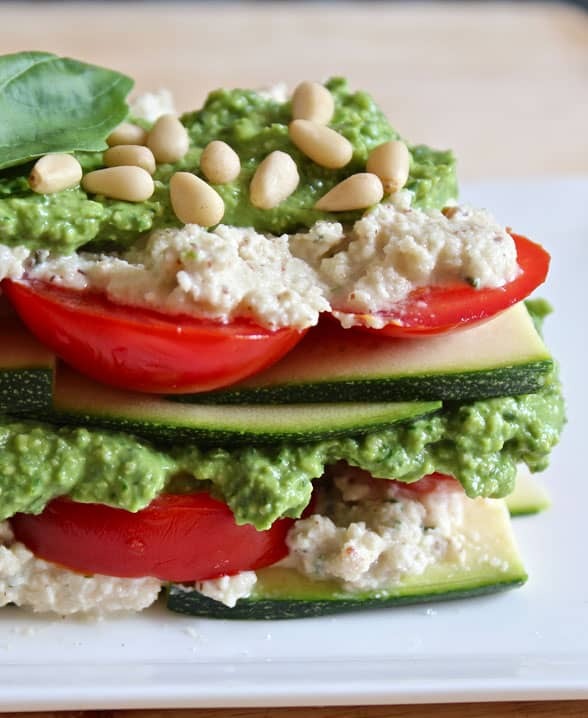 That’s why I love raw foods; anything can be made into a raw recipe, it’s all about experimentation, but luckily for us Ella Woodward of Deliciously Ella has nailed the recipe for us so here it is: raw zucchini lasagne! Just as creamy and flavourful as the real thing. 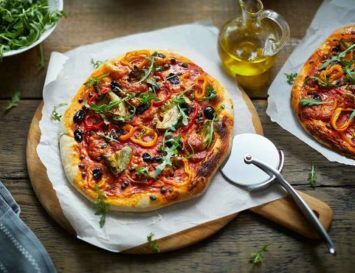 This raw pizza is topped with a raw tomato sauce, a raw cashew cheese sauce and then topped with chunks of fresh avocado, crisp peppers, lots of leafy green spinach and basil and the outcome is a wonderfully light and fresh pizza that would go even better with an ice cold beer. I love a BBQ, but getting all hot and smoky – not so much. 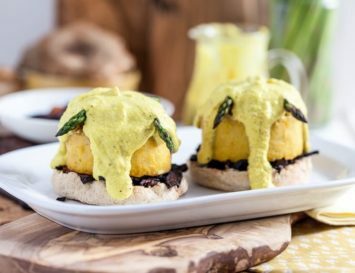 So I love this raw burger recipe, especially as the ‘bun’ is made from portobello mushrooms; it gives the burger a much lighter feel, which is perfect for summer time when we don’t really want to chow down on a starchy bun and feel bloated. The raw chips make a great alternative to fries, too. Making pasta from raw veggies is a brilliant way to keep your meals cool and fresh whilst not feeling like you’re half starving to death. I tend to prefer to use zucchini noodles (a.k.a ‘zoodles) instead of pasta no matter what the season. They never make you feel bloated, are perfect for gluten free eating, and they add a mother load of veggies to your diet. And you can do just about anything with them! If you like your food spicy, ginger, onions and jalapeno peppers add a heck of a lot of zing to this dish. Veggie rolls are low cal, quick and easy to make, and you can pack them out with an abundance of raw veggies, then pair them up with a dipping sauce for a really delicious go-to meal. The combinations of crisp and crunchy veggies wraps with the sweet peanut sauce? Pure heaven. There’s nothing nicer than enjoying the few remaining rays of sunshine outside with a decadent – yet healthy – dessert in your hands. And this raw tiramisu will hit just the spot. To keep this recipe 100% raw you’ll need to replace the oats with 3/4 cup of almonds and switch the maple syrup out of for around 12-14 medjool dates, but it’s totally worth it, right? Summer isn’t officially here in my house until there’s ice cream in the freezer. I used to buy a tub of ice cream similar to this before going vegan, and it was the type of affair that love songs are written about. So I’m SO happy to be able to re-create that ice cream in a vegan (and raw) way. Is there anything quintessentially British other than strawberry based ice cream? I’m loving this simple vegan recipe – it’s cheap and easy to make, yet oh so satisfying. 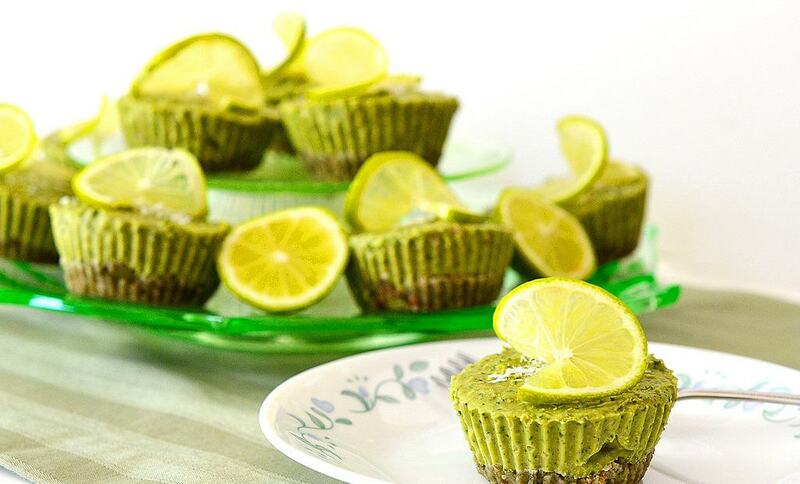 Lime is really refreshing on a hot day, and it’s also quite cleansing for the palette, making it perfect for dessert. The crust of this pie is made from a mix of pumpkin seeds and dates, whilst the filling is super creamy thanks to the avocado, with a surprise veggie boost from the kale! P.S. You won’t even be able to detect it – perfect for those who fear their greens. For me blackberries remind me of childhood; I’d spend my summer picking them fresh from a bush right next to my grandparent’s house and my God – were they delicious! So plump and juicy, and it really sparked a loving relationship for blackberry based dishes. So I’m going to be making these cheesecake bars all summer long, thank you! Whoa, am I right? This cake is like, wedding worthy. 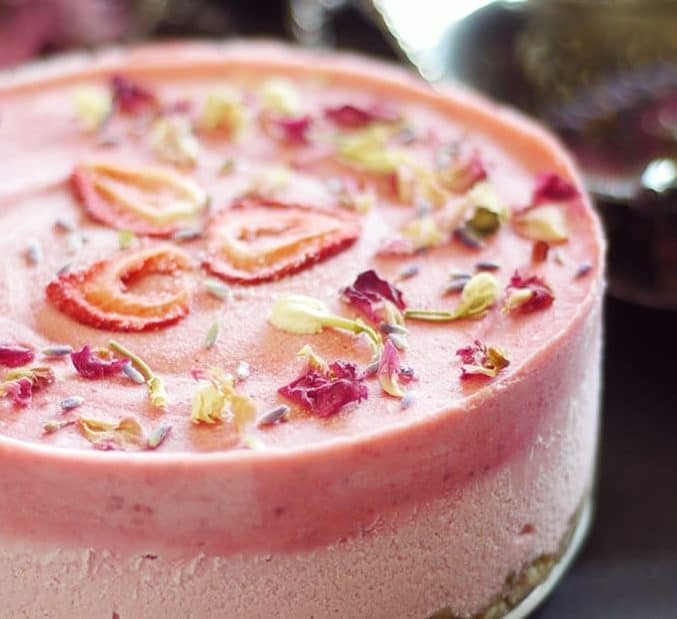 And given its exotic ingredients, including those posh Macadamia nuts, all topped with freeze dried jasmine, roses and strawberries – well, this isn’t an every day kinda cake by any means. It’s so damn beautiful, I had to add TWO pics! 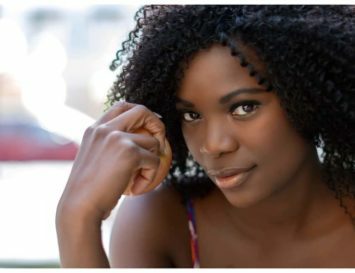 (it’s the main image, too).